Now that the Desert to Sea book is published I thought it would be fun to share some of the photos of Ric Rac Razzamatazz that didn't make it to the book. It was an interesting process because photos I would be more than happy to use for my blog just didn't feel perfect enough for permanent print. 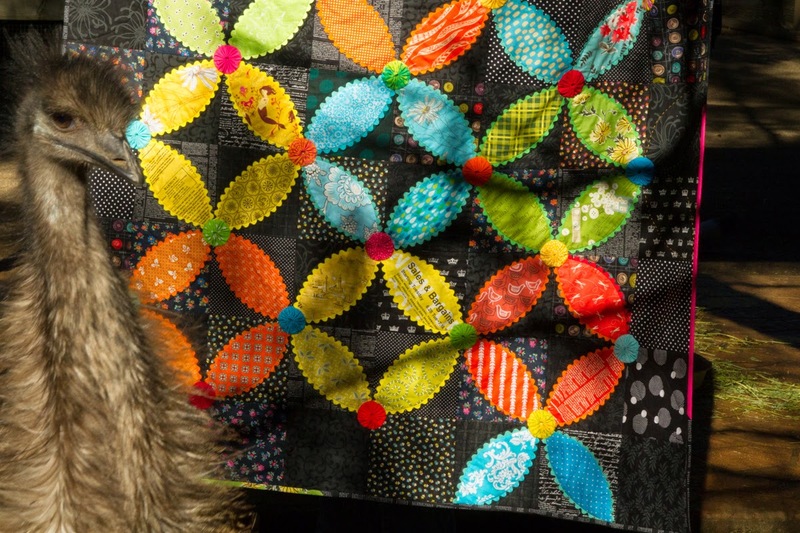 I have to take my hat off to all those photographers who take amazing photos of quilts. Getting the right shot is not as easy as it looks. We were limited with the days Mr Daisy and I could go on our photography adventures. There were weekends that we were free but then the weather wouldn't play along and it would be raining or too windy, or even too sunny and bright. My first thought was to try to capture the grandness of the Blue Mountains where we live, so we headed for one of the impressive lookouts. It was a nice sunny day but as we arrived at our destination the wind had picked up. It's hard to see but I'm the little speck in the center of this photo walking out to the lookout. Can see me holding the quilt by the right hand corners while the quilt it blowing sideways? It was really flying!! I was a little worried it might fly away with me! We captured the grandness of the mountains in this shot but not so much of the quilt. Here I am, windswept with crooked sunglasses. We also tried some bushy photos that day but they didn't seem to work either. 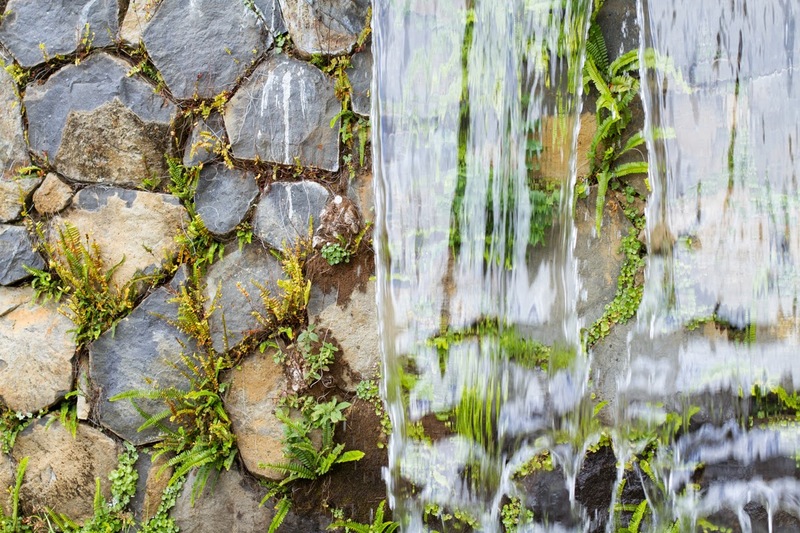 Rocks make a great backdrop, but for some reason this photo has a ghostly grey mist. This one isn't too bad now I look back at it but I rejected it because the corner had been cut off. Another day we went in search of a flowery garden. but the garden swallowed up the quilt. and this photo was a bit "Meh"
There was a point where I wondered about climbing into this waterfall with the quilt for a photo. It's probably best that I didn't. By this stage I was thanking my lucky stars that Mr Daisy was being very patient with me. I think he's happy I'm not a movie director. Our reward was going to beautiful places with views like this. As we were driving home one day, I practically jumped out of the car when I spied this giant fruit bowl. 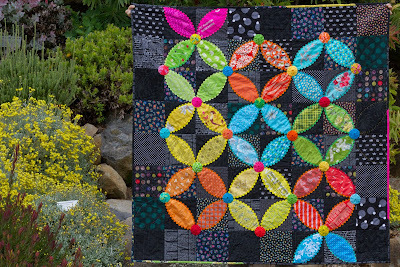 The most perfect background for a quilt of melon/orange peel blocks!! Alas, up close it didn't quite work, it looked a bit shabby but not in a chic way. 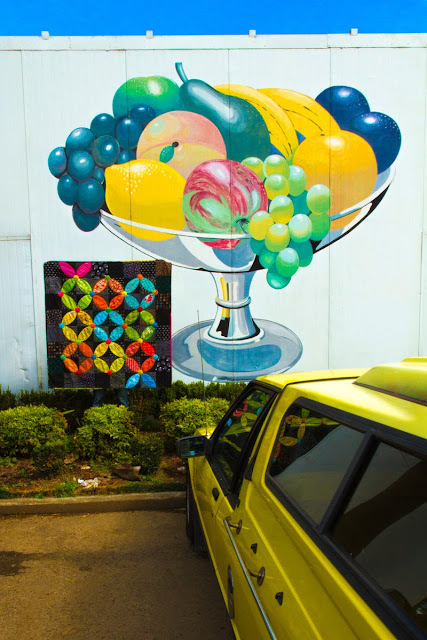 There was a matching mural but no matter what angle we took the photo from we couldn't get the yellow car out of the photo. We lurked around for a while hoping the owner would hop in and drive away but in the end we had to accept that it wouldn't be. One day I'll get photos of a quilt with this backdrop, it's the coolest mural! I'd often joked that it would be fun to get a photo of a quilt with a snake slithering across it. It was this idea that made us decide to go to Featherdale Wildlife Park to see if I could get a photo with some Australian native animals. Just like the wind or the glaring sun the animals had their own ideas. We got this photo by running around after the Emu, imagine chasing a giant camera shy chicken. And the kangaroos were so interested in the quilt they refused to turn around and look at the camera. A koala saved the day with it's cute face and fluffy ears. It posed like a super star when we jumped up with the quilt for some quick paparazzi photos. 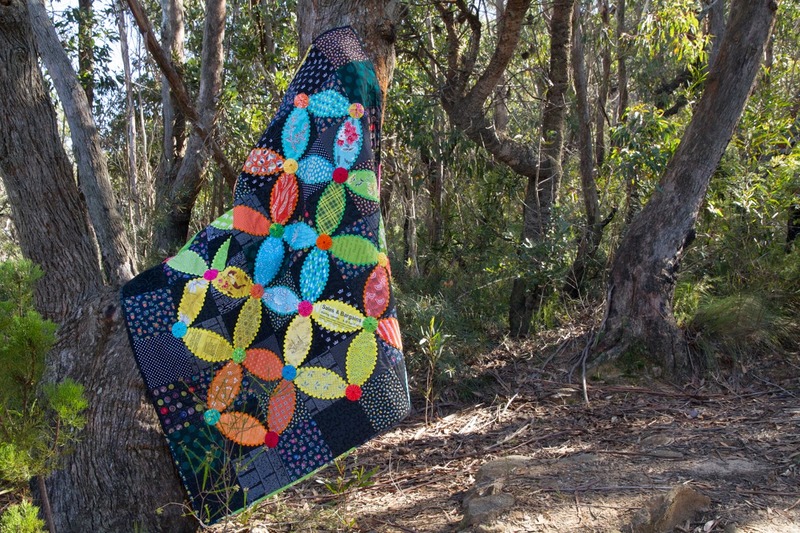 That's one of the photos you'll see in Desert to Sea: 10 Quilts From Australian Designers. It doesn't get cuter than a koala. I'll leave you with a funny thing... During all our times posing with the quilt and taking photos in the different places we went not a single person asked what we were doing, not even at the wildlife park. isn't that odd? Ha, ha! I guess they thought you were odd!! ;-)) Love all the photos and the lengths you went to to get the perfect shot! It's a fabulous quilt Rachael- just so YOU!!! Thank you for sharing all of these great photos. Yes, that is surprising, you would have thought that you would get at least one or two comments. 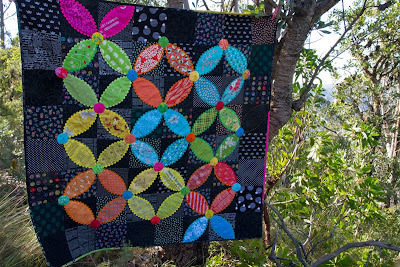 what wonderfully fun quilt photos! totally worth it as the idea matches the quilt! What an adventure taking photos. I love the emu photo it is a very cute. Even though nobody said anything I'm sure you got some strange looks. I wonder what the tourists at featherdale thought. Or maybe they just thought it's an Aussie tradition. Your critical eye for photos for your blog as well as the photo shoot stories are a big part of who you are. Mr D is also such a willing photographer in all the adventures. Fun, behind the scenes post here. Love that no one asked what you were doing! Your quilt is beautiful, and I'll be on the lookout for the book. I reckon they were too scared to ask .... mr daisy is a keeper for sure. But really, what a truly gorgeous quilt. It ticks all the boxes and just screams your very own style. Nice work. YES! Orange peels!! And ric rac! I knew I liked you! We are too alike, but you make quilts with a certain amount of style and pizzazz!! LOVE IT! Beautiful quilt & best photo shoot -- EVER! p.s. Did I say I loved the quilt? Thanks for sharing your behind the scenes photo shoot. Your quilt is wonderful -so full of color and life! haha! I guess people know to leave us Crazy Quilt Ladies alone! In all seriousness, its incredibly tricky to get the perfect shot! You really did have to go to a lot of trouble for the right photo. 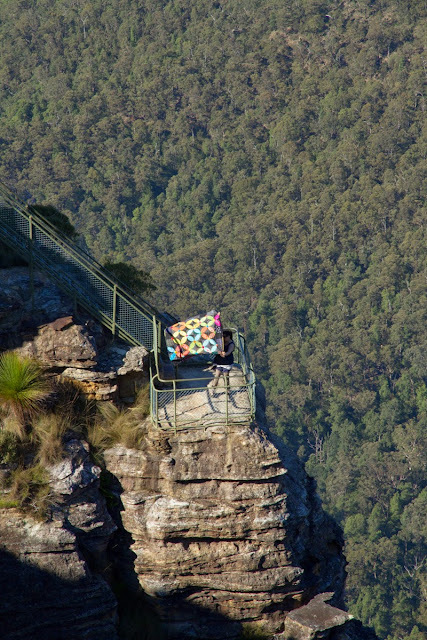 You are lucky your quilt didn't blow off the lookout with the amount of wind there was on the day. 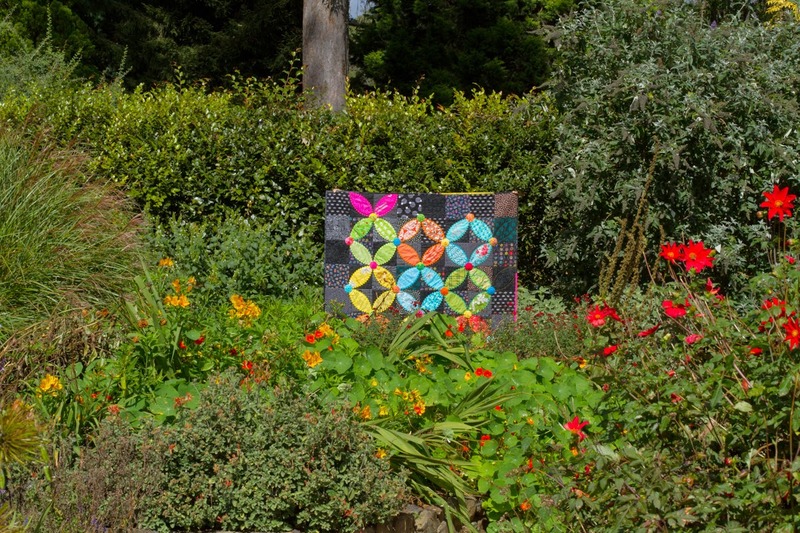 It has been delightful to see your quilt in so many different locations. It is such a gorgeous quilt and I can see why you wanted the perfect photo to show it off. You certainly went to ends of the earth that I've never seen to get some great photos - even though they weren't quilt book worthy. I enjoyed seeing the ones that ended up on the cutting room floor. I think some of those photos have a great life unto themselves. 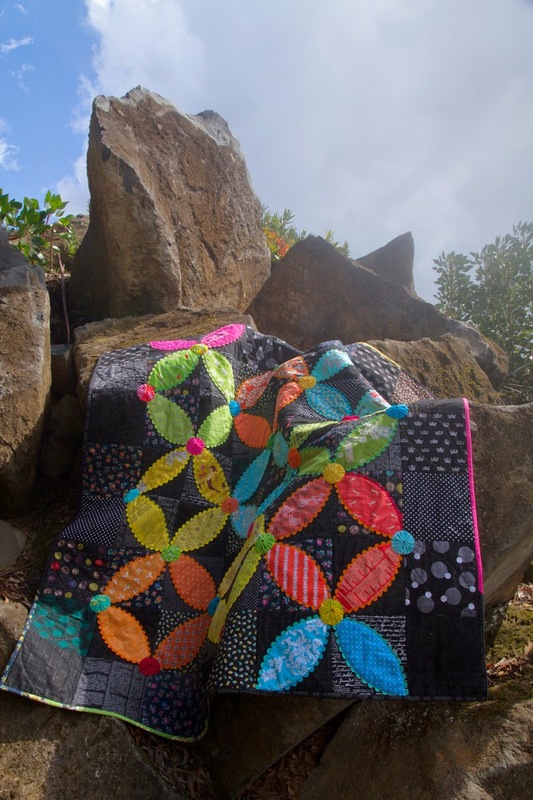 I loved your story of finding the right location to take a picture showing your lovely quilt. I can understand why the kangaroo was so interested - I would have been gazing like him. I am not a good photographer but always photograph each of my quilts for my Flickr record. However, I tend to take them in a hurry and the photos never do justice to the quilt. Perhaps I need a few lessons from you! How odd that no one asked what you were doing. Aren't people strange? My compliments to Mr Daisy, a very patient man indeed! It never ceases to amaze me how much work goes into getting that one (or more) perfect shot. 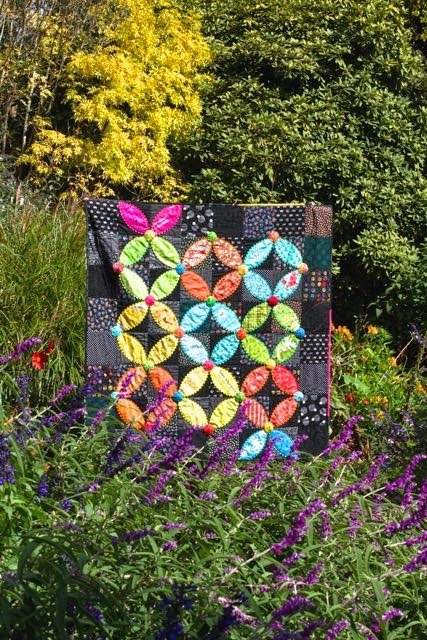 It's a stunning quilt, so bright and fun and I can see why you would want to showcase it perfectly and why it could be difficult to get that perfect picture. 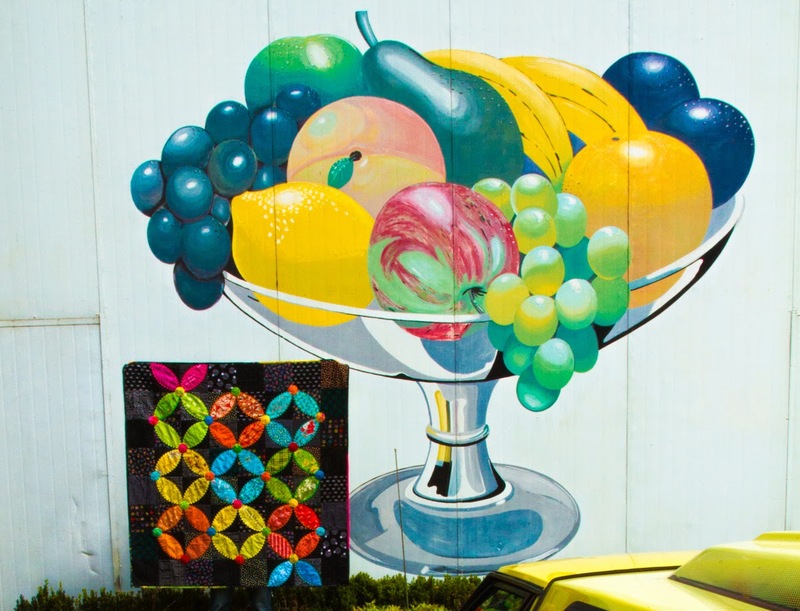 I do hope you get a photo of a quilt by the fruit bowl mural some day, it's really beautiful. first of i LOVE that quilt. the colors are fantastic. getting the right shot is so hard. people who don't do it... or blog have no idea what goes on behind the scenes. Beautiful quilt, thanks for the wonderful photos! I have been so busy that I missed your last few posts. Congrats on your Quiltmania cover. I am just about to head to my LQS to pick up the newest issue and look forward to reading all about you and your blogging. 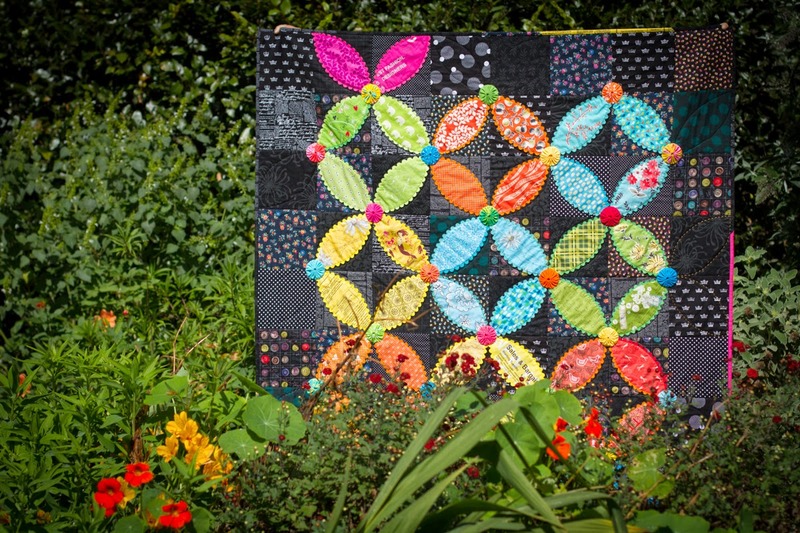 Love the ric rac quilt. As always you are such and inspiration! Gorgeous quilt!!!! Looks like you had almost as much fun photographing it as you did making it LOL!!! No matter what the competition, your gorgeous quilts will always shine through! Rachael. Congrats and you've made me laugh because some of my photo shoots don't work out. Great quilt! This quilt is just so fun. No matter what environment it's in, it shines! Beautiful quilt, and I enjoyed ALL the pics! I even like the one with the bright yellow car in it! What fun! I think Mr. Daisy deserves an award for being so patient with the process. 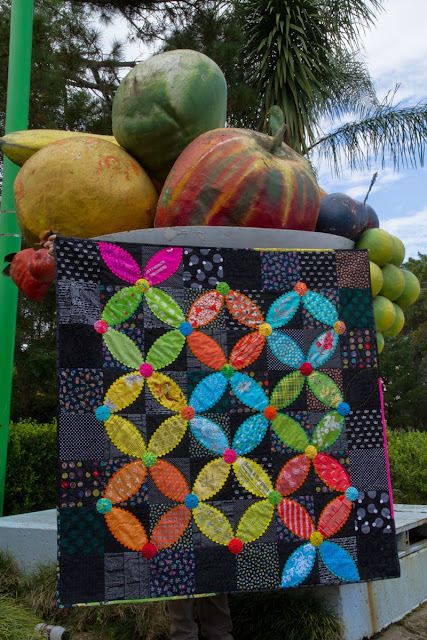 I could see this quilt 'hanging'by the corner from the bowl as if it was stuck underneath those gigantic fruits but you are right about the kangaroo's cuteness. Thanks for the trip to the mountains! Congratulations to you both for going for the "money shot". Your determination is amazing as is your quilt. Which photo was chosen in the end? 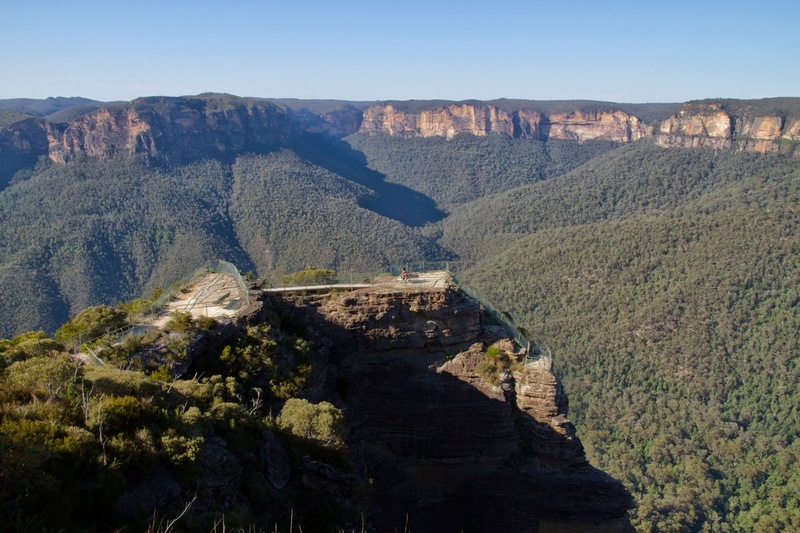 Thanks for the pictures of the Blue Mountains, how amazing are they! Wow, adventures in quilt photography! It looks like you and Mr. D had fun. I LOVE your quilt!! I think my fave photos are the ones with the animals, of course. How funny - I wonder what they were thinking. Probably how lovely it would be to curl up with the quilt. *grin* Mr. D deserves a big award for helping you out. What a guy! p.s. I love your quilt! So fun! The lengths you'll go for a good shoot-- nice of Mr. Daisy too! It's a lovely quilt that I hope to see more of, especially with that masterful rick rack. And wow, what vistas!! You always find such great spots to take photos of your quilts and your "reject" pictures are just as exciting and unique. 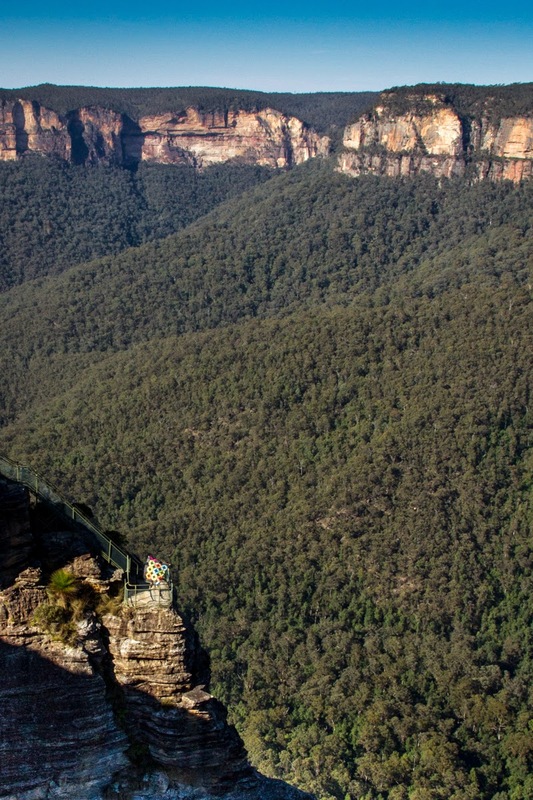 Love all the shots of the blue mountains - they are so vast! Fantastic quilt!! Great pics; I love the kangaroo pic so much! Thank you for sharing. Congratulations on the publication. the kangaroo loved your quilt and why not - it is so wonderful. He is studying every stitch. I can't wait to see the koala. What great photos! I love seeing the incredible country you live in. thanks for sharing your adventures in photography. Hi Rachael, you go to so much trouble to photograph your quilts! I hope you had fun in the process. Your quilt is wonderful and looks great. You are so clever and imaginative. No wonder the kangaroos kept studying it! so maybe she appreciated all the work you put into this quilt! lovely and ALIVE!! 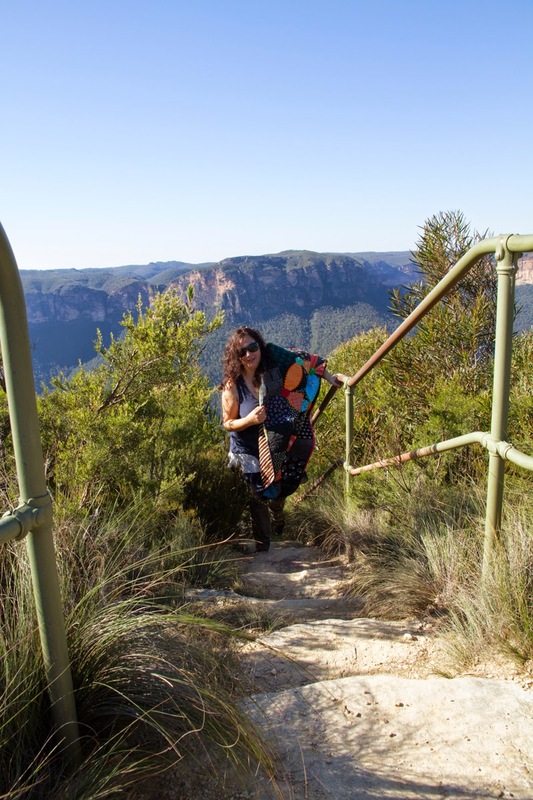 Yes Mam, Your Blue Mountains are a beautiful place for a quilt shoot. The bright orange peel sure pops out there. I really like it with the banana car ! What a great quilt Rachael. 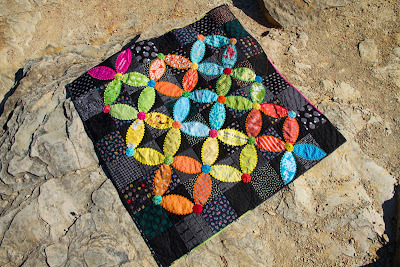 I love this quilt, all those pretty colors make me happy! These pictures are so fun and now I feel like I have been to the Blue Mountains! What a FUN post! Quilting can lead to such fun adventures. 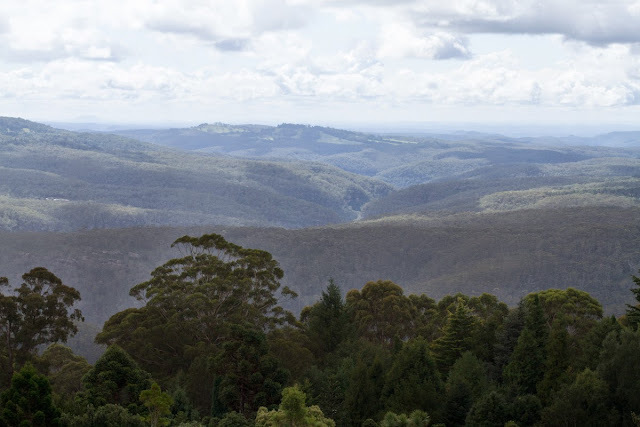 Your Blue Mountains are Gorgeous!!! And I love the kangaroo shot -- do you suppose Kanga is learning how to quilt??? There is nothing more fun than seeing the bloopers.....although your photos aren't bloopers either. I think we are always our worst critics. 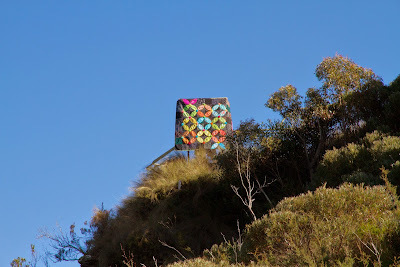 I've enjoyed following your quilt around the blue mountains. Fabulous, fabulous, fabulous RAchael! Pink Floyd is just about ready for a photo shoot! And yes odd that people don't stop and ask...there were a couple of people around when we did Diamonds at Large on the beach but nobody asked...but they did look! 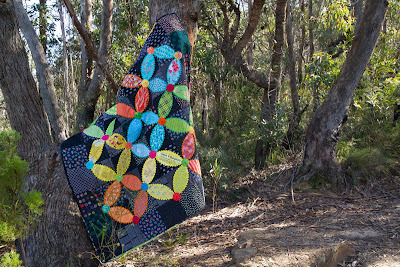 Rachael, is that your clamshell quilt which won best in show award in Modern Quilt Show Australia? Well first I LOVE this quilt - my favorite pic has to be the kangaroo, it really looks like he/she? is studying it closely! The Kangaroo Quilt Police maybe. You surely do live in a beautiful country, hon! Laughing that nobody asked what you were up to - I've done photo shoots around here, and nobody ever asks. Maybe they just don't want to know! I'm the opposite, I always want to know! 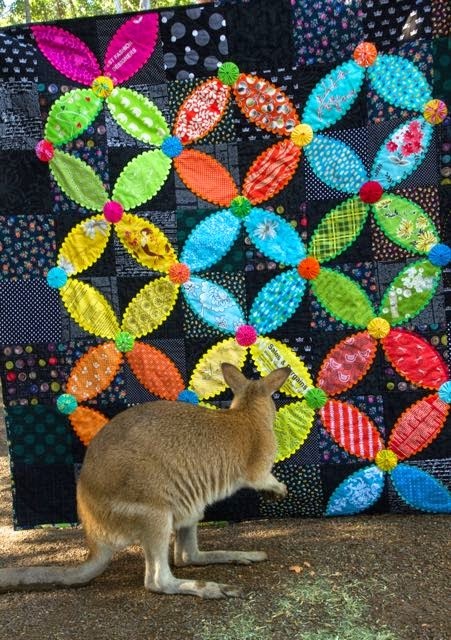 I loved the picture of the kangaroo examining the quilt! Is he a member of the quilt police? I enjoyed your photography process. Some of them were very good! Strange that nobody asked why you were taking pictures of the quilt everywhere. Maybe they thought you were professional photographers? Rachael! I am so behind on my blog reading! 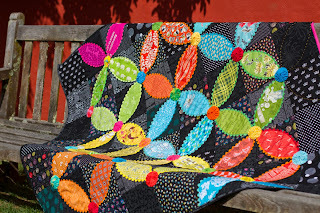 I love this quilt and the yo-yos are the best! But it is so fun to see your photo shoot. Oh my! I am exhausted just looking at the pictures! hahaha! Ha ha ha! This quilt has certainly been on some wild adventures! I Know this was an older post Rachael, but I had to tell you I loved ever photo you took of the quilt. It is amazing, and I would love to make one similar!